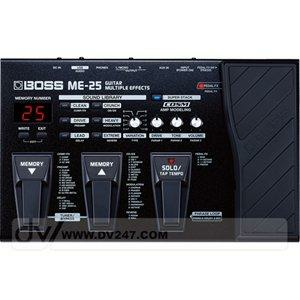 Boss ME-25: Powerhouse FX with Stompbox Simplicity. The affordable Boss ME-25 is packed with powerful BOSS features to make you sound like a pro, yet itâ€™s as fun and easy to use as a stompbox. The built-in SOUND LIBRARY gives you instant access to dozens of classic and modern effects. Simply choose a category, select a variation, and play. Customise your sound with simple twists of the Drive, Tone, and Volume knobs. With COSM amp models onboard, plus Super Stack and Phrase Loop, the ME-25 is a dream processor for guitarists who want great sound and ease of use. The sleek, black and white design of the ME-25 makes each button, knob, and pedal easy to see and access. Three footswitches, an Expression pedal, four knobs, nine backlit buttons, and enlarged LED panel provide an uncluttered control panel thatâ€™s great for any environment â€” even on dark stages. Its price might imply â€œentry levelâ€� but the COSM-driven ME-25 is nothing but first class. Exquisite amp models derived from the deluxe ME-70 cover a wide stylistic landscape, from classic to contemporary. The new ULTRA METAL offers screaming hi-gain distortion for all kinds of metal music. Included in the tone palette is SUPER STACK, which, with one press of the dedicated button, makes a small practice amp sound like a monster stack. Dozens of ready-to-use presets are built into the ME-25â€™s onboard SOUND LIBRARY, all quickly selectable by category, but you can easily customise the sounds with the dedicated front-panel knobs. Free downloadable Librarian software also lets you edit and save your sounds easily and conveniently onscreen. Connect the Boss ME-25 directly to a PC with a USB cable and you have a personal recording studio at your fingertips. The ME-25 can function as a USB audio interface, which creates a convenient, consolidated studio setup with Cakewalk SONAR 8.5 LE software (included). With this setup, you can stream audio back and forth between the ME-25 and PC directly via USB.